ABC-TV's "The Outsiders" episode dealing with UFOs (August 18) was even worse than I expected, though the customary formula was implemented. Ya throws in a few fictional movies and TV shows containing flying saucers or absurd alien fantasies, followed by interviews with "experiencers" or witnesses whose backgrounds we know little about, and then you top off the whole exhibit of the purely sensational with debunkers disguised as skeptics. We also got to see a clip from the TV series, "V," which hasn't even aired yet (is that what this was really about, to showcase and encourage interest in upcoming TV shows which, based upon current TV offerings from all walks, may be doomed from the get-go?). I used to respect ABC's UFO reporting, but that era was so long ago. I guess I wasn't surprised that this year's MUFON conference was portrayed minimally as little more than a circus atmosphere entity (and host Juju Chang used the uncomplimentary term, "UFO enthusiasts" at least twice during the program), but taking an opportunity on more than one occasion -- in my opinion -- to make light of and display just a shade of ridicule and implied vilification toward respected veteran UFO researcher and psychologist Dr. R. Leo Sprinkle was unconscionable. His years of work with the organization APRO were long and informative, and how strange that the university he served for so many years suddenly had problems with his long-recognized UFO research. Of course, next the late Dr. John Mack's Harvard reputation was thrust into the mix because he "helped propagate" so much interest in UFO abductions. Nice that ABC could give fellow psych colleagues Clancy and McNally ample opportunity to hawk their well-roasted "sleep paralysis" (probably appropriate in some cases, but surely not all) chestnut to national viewers, topped off by Dr. Clancy's assertion that earth has never, ever been visited by extraterrestrials (a belief based, perhaps, upon her extensive non-existent training as an astrophysicist?). How thoughtful and ill-informed, also, for host Chang to assume that all abduction accounts seem to begin in bed. Anybody care to focus upon multiple abductions (Hickson & Parker come to mind) to nail this foolish statement to the wall? All in all, it seems the debunking element was flush with demonization time during this sixty minute abomination. Speaking of chestnuts, there it was, turning up briefly, yet right on cue, like the weeds of springtime -- the SETI Institute, lord and master of all potential information about extraterrestrial life. If SETI doesn't announce it, you know it just isn't happening. How interesting that this clunker was overshadowed by news a day before that Great Britain had released more official UFO files, including information about the extremely intriguing Rendlesham Forest (re Col. Charles Halt) UFO case. We in the U.S. should be so fortunate with our government, especially when we get stuck with only this televised exercise in nothingness. I don't know who the on-screen "experiencers" are and, frankly, I harbor a few bags of doubt pending a real scientific analysis of the (so far) non-evidence presented via the ABC/Disney TV network. As far as the Romanek case goes, which received far too much attention in this limited series, skeptical UFO researchers have already had their day with that puppy and negativity exists in numerous quarters, but I suppose some juries are still out, so let the festivities continue. My gag reflex almost went into overdrive at the very end, when religion was incorporated into this pathetically uninformed mix. Yet -- the TV UFO formula was complete and faithful to the standard, uninspired recipe of tripe, and ABC had turned out yet another clone of previous attempts. Too bad, however, that the vast UFO-uneducated TV audience will never know something important here -- that certain respected UFO researchers allegedly declined when asked to participate in this fiasco because they suspected in advance what a piece of crummy formula nonsense this would be. Unfortunately, this is not new, and it's a discussion I've had with various researchers now and then. Commercial TV networks have produced a steady diet of UFO-related drivel over the years, and the consistency of these generally sensational burnt offerings has chased away many of the best and most knowledgeable UFO researchers, who wisely understand that their reputations will be pilloried in the name of ratings, guffaws, debunkers and electronic tabloid sensationalism. The networks could accomplish far more and, yes, rake in the ratings by referencing the best UFO cases and avoiding the agenda-infested debunking community. But, again, gaining the trust of researchers, witnesses and organizations whom they vilify and ridicule in very subtle terms every time some network executive thinks it's time to drag out flying saucers appears darned nearly impossible by now. A lack of common sense oft reigns uncomfortably supreme in the TV tabloid world, whose members sometimes release their pit bulls in the wrong yard to attack and chew up the obvious, while the debunkers, welcomed warmly, swarm in like medics, ready and willing to patch up the wounds to their own liking. Fractured fragments of truth ultimately get mixed up in the process, seldom healing back the way they should before the next media hit. So just wait a few months and, like inevitable annual showings of "The Sound of Music" on commercial TV, the whole process will be repeated like clockwork. What would TV do without having -- hmm, maybe this would be a great sitcom title -- lemmings in charge? 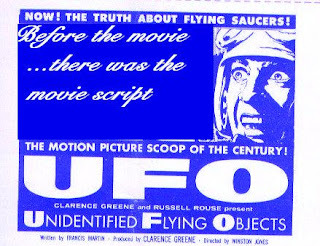 For those of you familiar with the 1956 motion picture documentary, "U.F.O.," be sure to click the link to my blog regarding the film because I've finished posting, in 17 brief parts, my comments about the original script -- the one Tom Towers (who played Al Chop) stored, more or less, securely behind his living room sofa for years. I think you'll discover the differences between the script and final production of interest. Who knows, maybe one day some enterprising movie industry people will remake the production using updated information that demonstrates just how seriously (very) UFOs were/are taken by the government.